Manufacturing, Trading, Importer and Exporter of Magnetic Chucks And Holding Magnets. 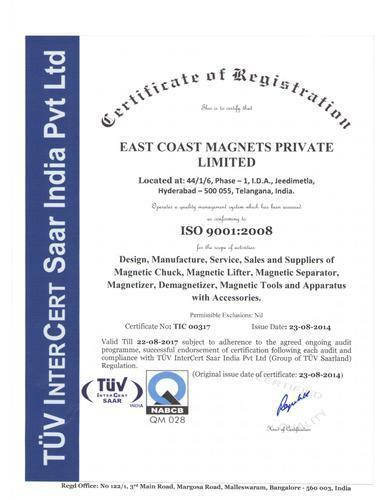 Incorporated in the year 2000 in Telangana, India, “East Coast Magnets (P) Ltd.” is dedicatedly engaged in Manufacturing and Supplying a vast range of quality approved products. Our wide assortment of products encompasses Magnetic Chuck For Grinding, Magnetic Chuck For Milling, Magnetic Lifter For Block Handling, Magnetic Lifter For Plate Handling, Magnetic Lifter For Billet Handling, Magnetic Lifter For Scrap Handling, Magnetic Separator, Magnetic Drill Stand, Magnet For Moulding Machine, Laboratoty Demagnetizer and many more. Our products are manufactured by making use of the latest machines. Our offered array of products is widely cherished for its unique features which include rust resistance, smooth operation, accurate dimensions, low maintenance requirement, enhanced durability, easy to use and many more. We manufacture our products under the brand name of "Sarda Magnets". In addition to this, we are able to manufacture these premium quality products which are used in number of industries and other allied areas. As client satisfaction is the main aim of our firm, so we are committed to deliver these products within promised set of time span at most reasonable rates. In addition to this, we firmly believe in the ethics and morals of business. Apart from this, we have been able to create a reliable clientele base within a very short span of time. Additionally, we are well applauded as one of the reputed firms of the industry and have been accomplishing numerous achievements with the aid of “Dhiruj Sarda (Director)”. Our team of dedicated professionals supervises the whole operations of fabrication and testing so as to make sure that only faultless array is delivered to our respected clients. The ultimate strength of an organization is its workforce and it is no different for us. Ours is composed of supremely talented individuals who understand their work and have never failed to deliver what is expected out of them. The dedication, efficiency and skill of our team is something that cannot be doubted and they put a great share of their time and effort to match the productivity in order to meet the customer requirements. We rightly believe that the real power of a company is its infrastructural base and implement the same in our products. Thesecome with the excellent methodology that is backed with the latest technological trends demanded by the market. We do not shy away from researching and implementing the needs and specifications as required by the customer. We have highly equipped work environment that enables our workforce to deliver the best. We offer products that have an ergonomic design, supreme performance, well-tested quality, easy usage and above all highly affordable prices. We provide solutions to the demands of customers by giving them the machines that come with assorted specifications. We have always been able to deliver what has been expected out of us and have always fulfilled requirements of our customers on manufacturing, packaging or delivery grounds. Quality checks are our USP as none of our products is delivered before it is thoroughly checked by our team of highly efficient professionals. We believe that the product quality is something that just cannot be compromised on any grounds. As a company that sticks to the guided industry protocols, we have never failed to impress our customers. Each and every product of ours goes through multiple rounds of quality checks before it is finally approved and sent for delivery.